In 1971, a group of construction workers began digging on the slopes of a hill named Mawangdui, near the Chinese city of Changsha. Since the workers were about to construct a spacious air raid shelter for a nearby hospital, they were digging deep into the hill. Before 1971, the Mawangdui hill was never considered a place worth the attention of archaeologists. However, this changed when the workers stumbled upon what appeared to be a tomb hidden beneath many layers of soil and stone. The construction of the air-raid shelter was canceled and, several months after the workers’ accidental discovery, a group of international archaeologists began excavating the site. The tomb turned out to be so massive that the excavation process lasted for nearly a year, and the archaeologists needed help from as many as 1,500 volunteers, mostly local high-school students. Their painstaking work paid off because they discovered the majestic ancient tomb of Li Chang, the Marquis of Dai, who governed the province approximately 2,200 years ago, during the rule of the Han dynasty. The tomb contained as many as 1,000 precious artifacts, including golden and silver figurines of musicians, mourners, and animals, intricately crafted household items, meticulously designed jewelry, and a whole collection of clothes made from fine ancient silk. However, the value of these items was immediately topped by the discovery of the mummy of Xin Zhui, the wife of Li Chang and the Marquise of Dai. 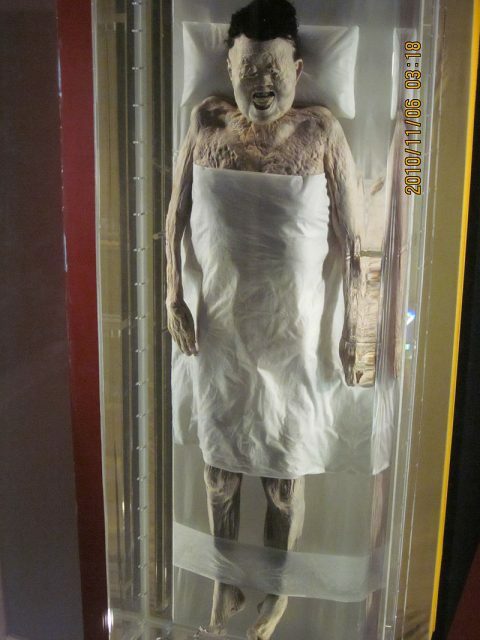 The mummy, which is nowadays known as Lady Dai, the Diva Mummy, and the Chinese Sleeping Beauty, was found wrapped in 20 layers of silk and sealed within four elaborate coffins enclosed in one another. The outermost coffin was painted black to emphasize death and the passing of the deceased into the underworld. It was also adorned with feathers of various birds because the ancient Chinese believed that the souls of the dead have to grow feathers and wings before being able to become immortal in the afterlife. The inner coffins depict Lady Dai alongside various mysterious landscapes of the underworld. The archaeologists were stunned by the pristine condition of the mummy. Well-preserved mummies had been discovered before the discovery of Lady Dai, but her condition was unprecedented. Her hair was intact and her skin was soft and moist, showing virtually no signs of decomposition. Furthermore, her muscles were in such good condition that her limbs were actually bendable after she was sealed in an underground tomb for more than two millennia. Researchers concluded that she was most likely immersed in some kind of an unidentifiable acidic liquid which completely prevented decomposition. An autopsy of Lady Dai was performed in December of 1972. It revealed that she died in her 50s, most likely of a heart attack that resulted from poor health. 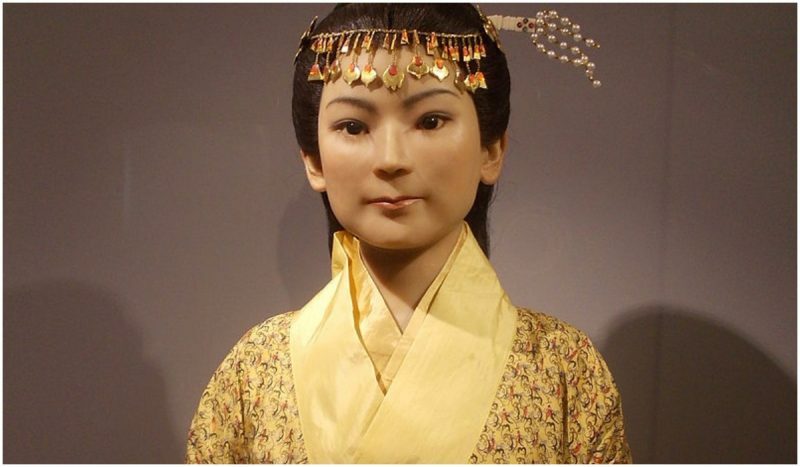 According to historians, Xin Zhui was an esteemed noblewoman who lived a lavish life of privilege and luxury. She was extremely fond of music and had a whole troop of musician-servants who performed for her whenever she pleased. She was most likely a skilled musician herself, a player of the quin, an ancient Chinese seven-string instrument which has been associated with wisdom, intellect, and prosperity. Also, since she was the wife of the Marquis, she was able to enjoy various kinds of food which were unavailable to the common people of the time, such as different kinds of shellfish, venison, mutton, and foreign fruit. The autopsy also revealed that Lady Dai’s blood was type A and that she most likely suffered from diabetes. Despite her ailments, she outlived her husband and likely even her son: both of them were found buried in the same tomb alongside her, but their remains had decomposed over time. Also, the researchers who performed the autopsy discovered melon seeds in Lady Dai’s stomach and concluded that she ate a melon just two hours before death. While eating it, she was most likely unaware that her death was imminent. Also, she was unaware that curious scientists would probe her stomach 2,000 years in the future. 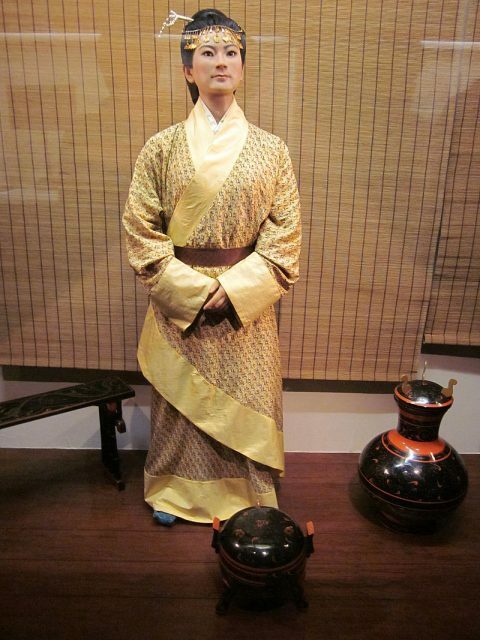 Nowadays, the mummy of Lady Dai and most of the artifacts recovered from her tomb can be seen at the Hunan Provincial Museum.